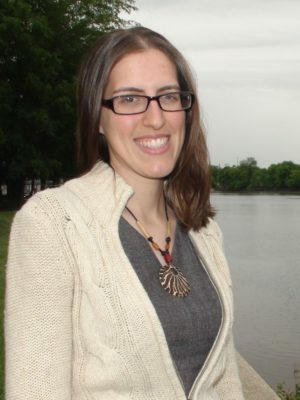 Sarah Bouboulis (pronounced Buh-boo-lis) joined the Partnership for the Delaware Estuary as a Science Planning Specialist in 2015. One year later she took on a new role: Habitat Project Specialist. This means she installs clean-water investments like rain gardens and natural shorelines. She also works with local businesses, schools, and organizations to beautify their landscapes, manage polluted runoff, and engage their employees and neighbors. A prime example is the Corporate & Community Environmental Stewardship Program. Bouboulis has a variety of experience working as a field biologist and project manager. She has worked for the Delaware Division of Fish and Wildlife managing bat, bog turtle, and amphibian projects. She has also worked for the U.S. Fish and Wildlife Service at Bombay Hook National Wildlife Refuge in Smyrna, Delaware. There she helped improve salt marshes, manage databases, and monitor both bats and birds. Bouboulis has a M.S. from Bucknell University, where she studied how bats adapt and behave. She also has a B.S. from East Stroudsburg University. Bouboulis is originally from the Lehigh Valley but now lives in Newark, DE with her husband and daughter. She enjoys hiking, birding, and farmers markets. To contact Bouboulis, please call (302) 655-4990, extension 119, or email sbouboulis@DelawareEstuary.org.